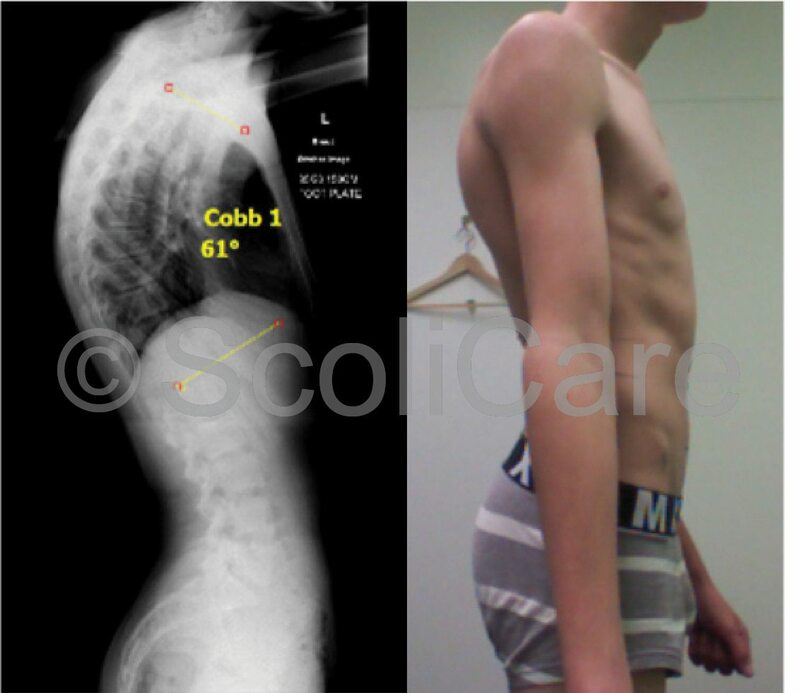 Patient presented to the Melbourne Scoliosis Clinic aged 16 years at the time of initial examination complaining of a sore back and poor posture. He was diagnosed with a Scheuermann’s kyphosis measuring 61 degrees. 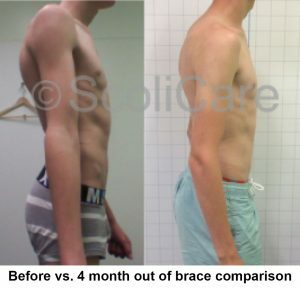 A custom 3D designed kyphosis brace was recommended to help reduce and stabilize the kyphosis. This brace was created specifically for this patient through a specialised 3D scanning and manufacturing process. It was recommended that this Kyphosis brace be worn for 20 hours per day for a 24 month period. The brace was very low profile and with clothes over the top was nearly impossible to see. 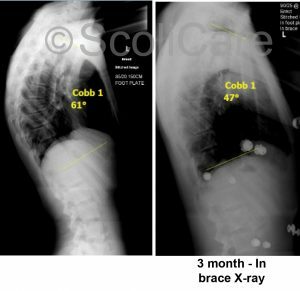 At the 3 month mark, an in-brace x-ray was taken. The in-brace kyphosis had reduced to 47 degrees.The patient’s posture was also improved. After 4 months of treatment, an out of brace x-ray was taken. The Kyphosis had reduced from 61 to 48 degrees. Scheuermann’s kyphosis is a progressive spinal deformity that can worsen with growth and if it gets too severe requires surgery. Bracing is recommended when a Kyphosis progresses beyond 60 degrees as there is a tendency for the curve to continue to worsen even after growth has finished. Surgery is often recommended if the curve is greater than 70 degrees. Old fashion braces used to be the only way to non-surgically treat kyphosis. The development of specialised kyphosis braces however, means there is now another bracing treatment option for kyphosis in teens and young adults that aims to not only hold but also reduce the kyphosis and is low profile and hardly visible under clothing. In this case, xrays showed both improvements in the patient’s postural appearance, and the degree of the curve. 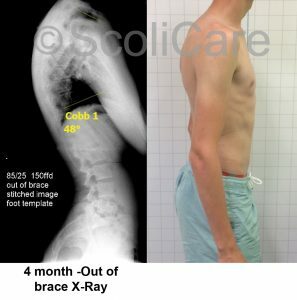 A rigid custom designed 3D kyphosis brace may achieve reduction in kyphosis curve in similar cases of Scheuermann’s kyphosis.